1. Combine the ginger, vinegar, sugar and red chilli flakes in a small pan. 2. Place over medium flame and bring to a boil, stirring often. 3. Remove and transfer to a bowl. 4. Bring a large pan of salted water to boil. 5. Add the shrimps and cook for 2 to 3 minutes, until just opaque. 6. Drain and refresh under cold running water. 7. Peel and devein, leaving the tails intact. 8. Add the shrimps to the ginger mixture and keep the bowl in the fridge for 2 to 3 hours. 9. Drain and discard the ginger mixture. 10. Pat dry and transfer to a serving bowl. 11. In another small bowl, combine all the sauce ingredients. 12. 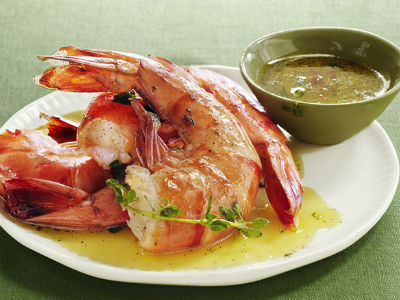 Serve the shrimps with the sauce. Feel free to comment or share your thoughts on this Ginger Shrimp Cocktail Recipe from Awesome Cuisine.